Winnipeg Model Railroad Club: It's time for the Winnipeg Model Railroad Club's Klinik Karnival! It's time for the Winnipeg Model Railroad Club's Klinik Karnival! It’s Klinic Karnival time at the WMRC! Come on down to the Charleswood Legion on December 9 and learn from some of Winnipeg's finest model railroading experts on how to improve your model railroading skills and techniques. We'll have several table clinics set up and you can visit each one at your leisure and learn how our talented clinicians do their thing. We have a great group all set to share their knowledge with you, and it's absolutely free! If you were to attend a model railroad convention in the States you'd have to pay big bucks to attend any series of clinics they would hold. But we're not charging one red cent! We're having our Annual 'Christmas Dinner'. Enjoy a delicious gourmet hot dog meal prepared by the world famous South family canteen crew. 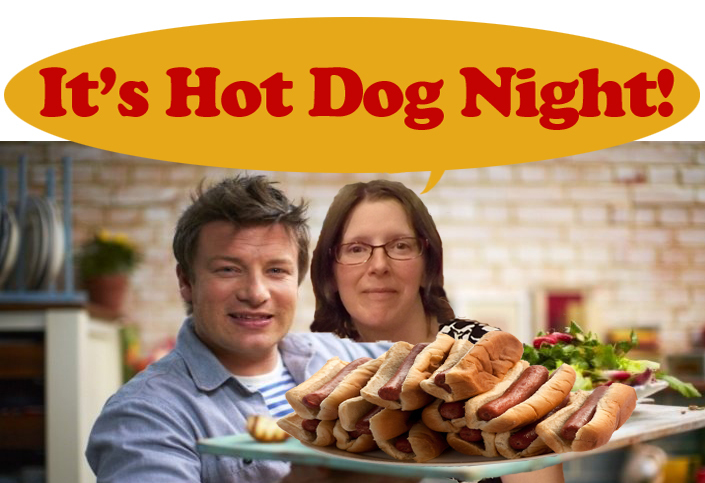 Our lovely canteen manager Jean South studied hot dog cooking with Jamie Oliver just for this event! The fun starts at 7:30PM at the Charleswood Legion, 6003 Roblin Boulevard. Please bring a non-perishable food item for the Christmas Cheer Board. There's plenty of free parking, and you don't have to be a member to attend! Guests are always welcome!